Dubai is UAE’s fastest-growing and most popular Emirate with vast job opportunities in the construction sector. Construction companies in Dubai offer excellent payment packages and perks from across the globe to attract workers, especially in India, Pakistan, Bangladesh, Sri Lanka and Philippines. Construction is said to be the blend of many different activities and is not just a simple process. There are many activities which need coordination when it comes to construction, if you want the construction to be according to your client’s desire and to be successful. Construction can be bout anything, it can be your dream project, your dream house or your office, etc. You’ll find many professional & big construction companies in Dubai that you must hire if you want a flawless building. Not to mention, Dubai is also home of some of the tallest buildings of the world. Al Futtaim represents an inspiring collection of leading international brands and offers the opportunities for professional development and exciting career. It is a well trusted, privately owned construction company in Dubai, which was established in 1930’s. Employs in excess of 44,000 people today, it is considered as a pioneer which operates through more than 110 companies and around 225 international brands are represented across industries as a wholesale trading, financial services, distribution, leisure, real estate development and hospitality. Entry into new territories beyond Greater Middle East and GCC to encompass South East, Africa, North Asia, Europe and Australasia which has been observed with the significant expansion in recent years through strategic acquisitions. In the fields of IT, telecommunication and Fire fighting, Arabian Construction Company provides services and solutions. It is a leading contracting and engineering company which is led by a team of professionals which are fully experienced and talented, thus ensures to support the clients with the best level of responsibility and commitment. The Arabian Construction Company has acquired the necessary skills and confidence with the collection of hundreds of projects and expanding for more than 50 years. It is capable of handling the most demanding tasks and challenges. The external process does not reflect the quality of work does by Arabian Construction Company, but is found internally throughout our operations and organizational structure. The Arabian Construction Company is continuously assigned by oil companies, government ministries and private sector to participate in the most challenging and exciting projects. Al-Habtoor started out with just a small engineering firm in 1970’s and has grown in with the United Arab Emirates and is today one of the most respected corporations in the region with great interest in the automotive, hospitality, education, public sectors and real estate. A solid reputation is earned by Al-Habtoor both internationally and logically and thus included in our list of top 10 construction companies in Dubai. Since 1971, Dubai has grown from traditional posts and modest fishing ports with traditional wind towers into vibrant, thrilling cities which is renowned for their world class and modern building airports, infrastructure and seaports. Behind this transformation are the leading organizations, the Saeed and Mohammad Al Naboodah group which has begun to operate since 1960’s in its construction and by 2007 it had merged its construction business to form 12,000 employee powerful Al Naboodah Construction Group LLC. The Arabtech Construction is one of the top 10 construction companies in Dubai, committed to build and expand on experience and capabilities and proficiency in building residential developments, high rise development hotels, industrial projects, commercial development, stadiums, villa, airport development, entertainment, communities and mixed use developments in Russia, MENA region and all across the globe. In 1976, Dutco Balfour Beatty LLC was originally established. When the mega project of the construction of Mina Jebel Ali, the Dubai Company and UK base Balfour Beatty joined it’s forced to undertake this project. After the completion of this project, Dutco Balfour Beatty LLC then participated in major civil projects which include, G station power, Arrivals terminal at Dubai international airport, water desalination faculty and the construction of Dubai Mall (the largest shopping mall in the world). With such a big portfolio, Dutco Balfour Beatty LLC is among the top 10 construction companies in Dubai. Laing O’Rourke was founded over a century and a half ago and is an international engineering enterprise. A single source solution is offered for some of the world’s most impressive organizations. Opportunities across a diverse range of professional fields and in locations across the European hub are offered by Laing O’Rourke. The breadth of skills which are required to run a multi-talented organization is the reflection of the vast variety of roles offered by Laing O’Rourke which also enables businesses to provide engineering modernism for the most challenging construction and world class projects. The construction company Saudi BinLadin group was established in 1931 and in 1950 King Abdul Aziz planned to first Saudi Extension to the Prophet’s Mosque in Madina. The Saudi BinLadin Group was set up to incorporate various BinLadin companies under a single involvement to prepare for an ambitious and more active international role. The famous group has built many constructions & a building project in Dubai. Wade Adams Contracting is a project development and a general construction company in the Gulf region. Innovation, reliability, sustainability and quality are what its reputation is built on and it also provides a range of services that can turn any concept or design into reality. It is an OHSAS and ISO certified company and have the capability, commitment and resourced to deliver a variety of projects which also includes underground utilities, infrastructure, marine works, district cooling, grading and bulk earthworks and MEP. ACTCO, one of the top 10 construction companies in Dubai belongs to a group of multinational shareholders and is a local company which operates in the UAE. It was established in 1975 and since then it has prided itself on an impressive record of successfully accomplished projects and has also enjoyed its status of meeting its schedules and to the highest satisfaction of clients. In each and every task, quality is practiced at all company levels and to provide clients with strong management determinations it offers services that exceed their expectations. 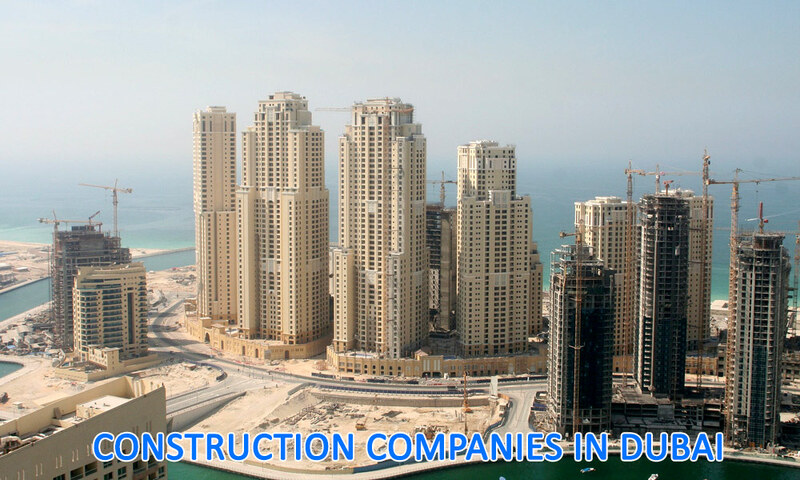 These are the major and top 10 construction companies in Dubai. If you’re looking for companies offering building maintenance, we have reviewed the top building maintenance companies in Dubai as well. If you would like to recommend a construction company in Dubai, please do so by adding comments below. I want to go to all of thez gezer copmanie and live in a 8pax room with others. · With over 8 years working with AutoCAD & Supervision, I have stayed on top of all of the updates and new software editions in order to better perform my tasks. · I can design exterior or interior plans in order to come up with a complete construction workup. · I feel that creating a new building or interior design requires the work of a full team and not just one person. I would bring that attitude along with an energy and enthusiasm that would be a benefit to national computing group. · I feel that a meeting between us to discuss my credentials and strengths would benefit the company. Please feel free to contact me at any time at (+968 93864370) or email me at akhilts89@gmail.com to set up a date and time. Hi i am looking for quality inspector job (QA QC) in any construction company in uae i have Two year diploma As Quality control and Quality Assurance. And i am on visit visia here in uae.Please contact me any time i will feel free. My contact no is 00971509231005. If any company Good offer mee. I m B-Tech (Hon) Civil. contact prestige constructions,UAE- one of the best construction companies in UAE, They are looking for a QA/QC Engineers and Jr. Quantity Surveyor positions. I am a South African site engineer looking to develop my career in the Middle East. With a track record of completing projects over the past two years In South Africa i am looking to join a company that will offer me exciting work and great learning opportunities. Nebosh holder graduate right now in Dubai on visit searching for job.. I am an Indain Accountant having more than 7 year experience in accounting field with valid UAE driving licence, now looking for a job in Finance field. I am nepali diploma in civil engineer.i have 12 years experience in road and building construction amoung them 5 years gulf u want to join any middle east company pla contact me .. I have 2 year of Indian experience & 2 years UAE Experience. Now I am working in Al Ain. I want to relocate to Dubai and I have to work in Dubai / Sharjah. So please let me know about the job vacancies. My name is Jobin Anthony and am currently looking out for a Job in Dubai. I have !year Experience in India and am proficient in PrimaeraP6. Please do inform me in case of any Vacancies. Myself Vaisakh Damodaran from India seeking job for the post of Quantity Surveyor / Estimation Engineer preferably in Abu Dhabi / Dubai. Have secured 5 years experience in the same field. Please inform if there exists any vacancies for the same. Currently on visit visa (3 months). I am a student at Coventry University studying Construction Management final year. I am writing to request an interview with one of your current Construction Managers in regards to a dissertation project aimed upon Project Management within Construction in Dubai. The interview is to last 30min either by telephone or Skype video conference. General questions about how the company resolves general construction issues faced on a day to day basis. If this is a request you may be able to assist with I will be ever so grateful and your company will be mentioned within the acknowledgements of the project with high reviews. Now a days on visit in Dubai UAE. SUBJECT:Application for Position of Civil Site Engineer/Supervisor. I am Civil Engineering Diploma Holder (DAE) from Swabi Engineering College of Technology (SECT)Pakistan And Registered by the Board of Technical Education (Peshawar).And i would like To Apply For the position of Civil Site Engineer/Supervisor in your Reputed Company. I am writing to inquire If you have any Vacancies in your Company.I have attached myCurriculum Vitae to be able .To provide you with Some information on my educational background as well as my experinces in the field of Engineering. I would be delighted to discuss any possible Vacancy with you at your Convenience,In case you do not have any Suitable openings at the moment,I would be grateful if you would keep my CV on file for any future Possibilities. I am sure that your esteemed organization will find me one of the most suitable candidates i have good Experince and command for this jobs like: Site Engineer, Quantity Surveyor, Survey Leveling, and Civil Draftsman. I hss done my B-Tech hons in civil engineering Preston University islamabad. I’m B-Tech hons in civil engineering and has five years experience in building field in multiple companies. Aasalamualikum I wanted work as a Executive Engineer in Dubai.My degree is Diploma in Civil Engineering and My B-Tech inshaallah will complete in three years but I wanted to work with completing my graduations. I have experience for Admin Dept in 2 years.. There is any vacancy ? I have 24 years experience in the commercial and industrial construction trade here in Canada. For the past 11 years I have primarily worked as a construction superviser, foreman, and coordinator. I am very interested in coming to work in the UAE. I have a current resume and cv. I’m looking for auto cad draftsman job. I have more than 6 year experience in uae construction projects. My name is Mohd Asif Bhat and i am civil engineer with one year experience and i am in search of job in gulf countries. please let me know if there is any vacancy for civil. I am diploma civil Engr from govt institute. I have 3year experience in construction work of site Engr post. I am looking a site Engr post in dubai. If any vacancy post please help me. So that my experience and genious suitable utilize develop work for your construction company. I am very interested to work in dubai. I am waiting for your call. I am diploma civil Engr. I have 3year experience in construction work of site Engr post. I am looking a site Engr post in dubai. If any vacancy post please help me. So that my experience and genious suitable utilize develop work for your construction company. I am very interested to work in dubai. I am waiting for your call. Hamdani Impex Human Resource Management Services established in 2015 located in Ajman Free Zone UAE. We provide Consultancy Services and the Packages with virtual office, Import Export License, Consultancies or Services license with UAE bank Account & Visa eligibility.